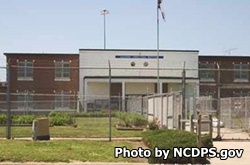 Caledonia Correctional Institution is located in Tillery North Carolina. It is a medium/minimum security prison that houses 1,038 adult male offenders. This prison has a fully functional farm that is operated by the inmates through the Correctional Enterprises program. The farm has crops, chickens, cattle, and a variety of vegetables that are grown year round. Offenders can also work in the cannery, which processes many of the vegetables into cans that are eaten by inmates throughout the state. Additional jobs available to inmates include kitchen, laundry, janitorial and maintenance duties within the facility. Inmates at Caledonia Correctional Institution can take adult education courses and earn a GED during their incarceration. Vocational courses are offered in culinary arts, plumbing, and masonry. Alcoholics and Narcotics anonymous groups and alcohol and substance abuse treatment is also available to inmates. All visits are by appointment only and must be scheduled at least 24 hours in advance. Visitation occurs on Sundays from 1:30pm-3:30pm, and on Saturdays from 8:30am-10:30am, and 1:30pm-3:30pm. Appointments should be scheduled by calling the facility on Mondays, Tuesdays and Wednesdays. If your inmate is at Caledonia Medium call (252)-826-4967 to schedule an appointment. If your inmate is located at Caledonia Minimum schedule an appointment by calling (252)-826-0051.